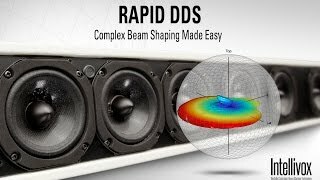 DDA (Digital Directivity Analysis) is a powerful acoustic modeling software tool that allows sound system designers to simulate speaker response in a 3D environment. Designed to work with any manufacturer’s CLF (common loudspeaker format) data along with JBL Intellivox products. This allows the user to model a complete JBL sound system while concurrently optimizing the directional behavior of any Intellivox product. DDA is a 64 bit Windows-compatible program that integrates geometric modeling, direct sound prediction, statistical room acoustic prediction, graphic visualization and radiation pattern optimization. It will also generate the output filter files necessary for fully customized Intellivox beam-shaping coverage. These files can then be uploaded to the onboard DSP using the WinControl software. Models can be imported into DDA from Odeon® , CATT Acoustic® and EASE® acoustic modeling software packages. Third party plug-ins are also available to import Google SketchUp® drawings into DDA.